Do you have a hard time Communicating the Gospel because you feel that you dont know enough? Do you feel like you need to be an expert in the Bible before you can share your faith? Maybe you are afraid someone will ask you a question that you wont have the answer too! Maybe you are just fearful of how people will act or respond when you tell them about Christ. Maybe you have been a Christian for many years and have never shared your faith. Well this course for you! CLICK HERE for Promotional Video | CLICK HERE for Course Flyer. Do you feel like you dont have the courage to share Christ? Maybe you are just having a hard time Communicating the Gospel because you feel that you dont know enough. You feel like you need to be an expert in apologetics before you can share your faith. Maybe you are afraid someone will ask you a question that you wont have the answer too! Maybe you are just fearful of how people will act or respond when you tell them about Christ. Maybe you have been a Christian for many years and have never shared your faith. Well this is the course for you! 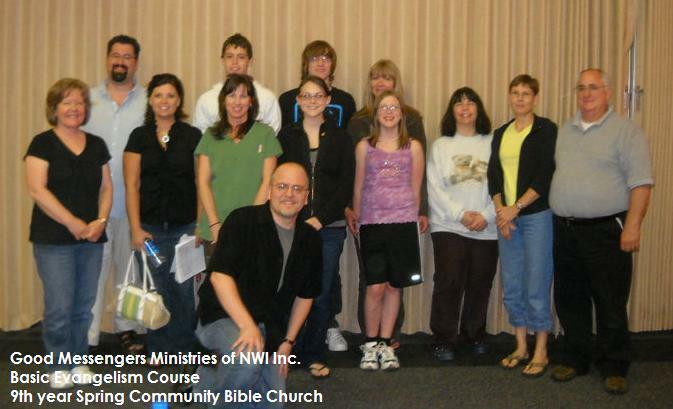 The Good Messengers Ministries of Northwest Indiana is proud to offer our Communicating the Gospel Basic Gospel Principles 101 Course. This course is Biblically based, and is specially formatted to train believers in a group setting to simply and confidently share the gospel with family, friends and strangers. This course is open to any believing Christian men, women, and teens. Bring a spouse, family member or friend. Bring a spouse, family member or friend. 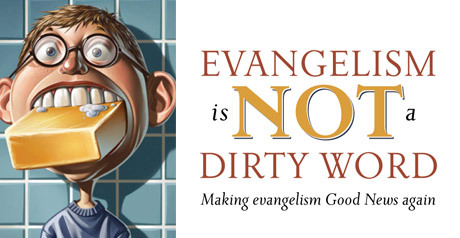 We have included lessons on "What is and isn't Necessarily Evangelism", "What is the Gospel", "What is the Importance of Repentance & Faith", and so much more. This eight lesson + course will teach you to overcome you fears, and help you to share with others a gospel message that makes sense. You will not be at a loss for words. You do not need to be an expert in apologetics. We will show you the process of contextualizing the Biblical message of the missionary mandate originated, given and commanded by Jesus.What we teach is NOT some new found method but rather we show you how Jesus evangelized in the Bible and show you how to use those principles in your witnessing conversations. It's not about a "Presentation," its about a "Conversation." 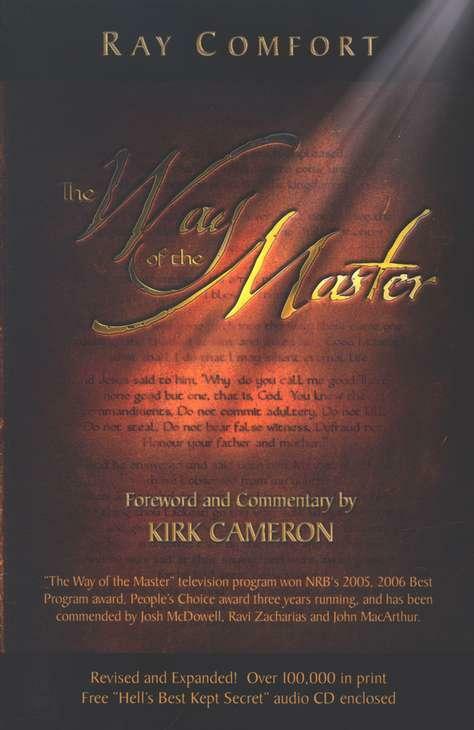 We will show some DVD's based off of "The Way of the Master" TV show series with Ray Comfort & Kirk Cameron that will show you through fascinating on-the-street- conversations how to witness. Weekly homework assignments will gradually coax, you, step-by-step, out of your comfort zone to reach your loved ones for Christ. You will be inspired and motivated as you learn, watch, and then do. Like countless others who have taken this course, you will be amazed at how using the Biblical Principles that Jesus gave us will transform your life and the lives of others. More importantly it will help you Communicate the Gospel more effectively. Our instructors don't just teach it...they use these "Biblical Principles" themselves in witnessing conversations. We at Good Messengers Ministries of Northwest Indiana dont believe in fancy, modern gospel presentations but rather we will show you how to engage a culture in a conversation "COMMUNICATING THE GOSPEL" of Jesus Christ! These items below are typically used in taking Good Messengers Ministries of NWI "Communicating the Gospel" course. They are only recommended and not required, but can enhance your studies. In most cases group discounts will apply when taking this course. Clicking on each item will take you to another site to purchase them individually (no discounts will apply). This is where the cost for the course comes into play. Materials can be shared. In other words, a whole family can take the course and share the materials. 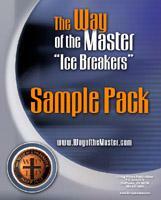 Please note: This course is currently based off of some of the Way of the Master materials & books. 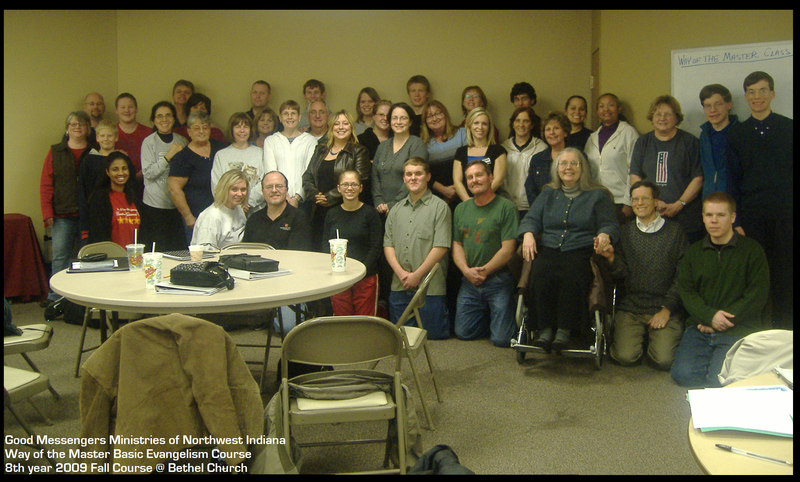 Hundreds of Christians have taken this course over the past decade from Good Messengers of NWI (some you will see in photos below). Personal references, and testimonies from individuals, churches, organizations, pastors, elders, and Christians young and old are available upon request. Let us know if you would like to be our next Host Church or organization to offer this life-changing course...email us today. 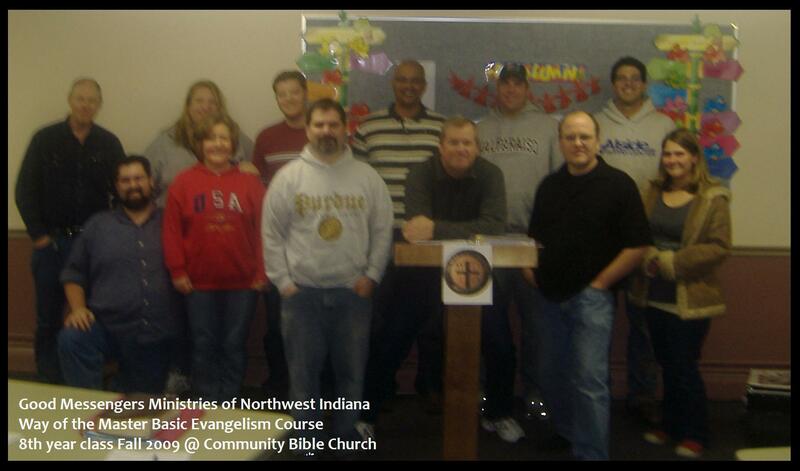 Note: Currently this course is only available through Good Messengers Ministries in Northwest Indiana. Below you will find a testimonial from a wonderful young lady who took this course a few years back and it dramatically changed her life. Stories like this are NOT uncommon from those who have taken this course. Please also note when she took this course her husband was not a believer. By the next year her husband became a believer and also took this course! Now they are sharing Christ with others...together! "I just wanted to tell you a little bit about what the Way of the Masters course is doing for me. We have only had two classes and I am already so excited I can barely stand it!! I would like to tell you why I am so excited and this email might get quite lengthy so hopefully you have time. One Sunday morning I woke up just like any other morning and since my littlest one hadn't woken up yet I took a shower and then went to check on him. I walk into his room to find him face down in his crib, dead. After I recovered, I was terrified. I knew that I had come very close to going to hell, I could feel it when I almost died. I knew that God had saved me from death but I didn't know why. So, I started reading my Bible and really repented of my sins and MY EYES WERE SUDDENLY OPEN to what salvation REALLY meant! I saw the announcement for The way of the Master in the church bulletin and I knew I needed to take it. I thought I was taking it, just to get more knowledge and grow in my Christianity. But now I know this is why God has spared my life! I am naturally very shy, but after reading about Moses, and Jeremiah I realized that it has nothing to do with me! I am just a tool, for God. He does it! I am so humbled by this opportunity, and an almost embarrassed by my inadequacy for God. Thank you, thank you, thank you!!!! For doing what God has called you to do! Thank you for helping me to do that too! He is my focus, He is my salvation, He is the beginning and the end, His does all things for His Glory, He is faithful, just, loving, compassionate, THE LIST NEVER ENDS!!! Praise the Lord Jesus Christ for He alone is worthy! " Missing from Photo: Michelle Sersic, Chris Minch-Clark, Allison VanDer Weide (taking photo), Tammy Deal. Middle Row: Cheryl Mathis, April Dieck, Rose Topp, Rich Wold, Deb Wold, Carol O'Leary, Mollie Stewart, Hugh Harper, Linda Harper. Missing from Photo: Lynn Beilfuss, Dan Ellis, Mark Gaertner, Rachel Gaertner, John Harrison, David Wells. Apologetics, is about building a case for our Faith...learning how to explain and defend our Faith. Good Messengers Ministries offers three apologetic classes to help defend your faith. 1) English Bible History 101: Learn how we received the Bible in the English language, and the price that was paid so we can read it today. Also helps us understand that we truly have the literal Word of God in our hands. This class is a Great defense for the Holy Bible. 2) Creation Science: This class is for us to better understand the Biblical view of creation vs. evolution. This class also helps explain where the dinosaurs went, why is the earth the way it is, and why science actually is interconnected with the Bible. 3) Bridges Muslims & Jews: Bridges is a course study that helps us better understand our Muslim and Jewish neighbors and how we can bridge a gap between our world to share Christ with them.